Home › News › Bright First Home at Scotton for the second year running! Bright First Home at Scotton for the second year running! The Time Trial season is just getting underway. On the Great North Road by Ferrybridge Nova’s Steve Smales and Torq’s Ele Haresign formed a male/female duo to come an incredible 5th in the Raventhorpe 10 mile 2up TT with 22:24. In the solo event Nova’s Stu Wood and Pete Watson were separated by a second with 22:34 (9th) and 22:35 (10th) respectively. 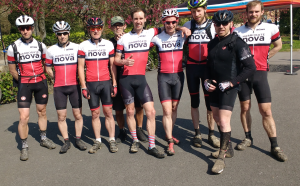 Nova’s Duncan Mullier travelled further afield to Derbyshire to clock 52:23 for 25 miles in the Burton And District Cycle Association event.